It all comes down to complex gorilla body language, they say. Pranks and silliness are usually on the decline by the time animals reach young adulthood, experts say. Gorillas, like people, tend to outgrow much of their youthful exuberance as they age. Play-fighting, pranks and silliness are usually on the decline by the time the animals reach young adulthood, experts say. A notable exception: "Zola," a 380-pound Silverback gorilla living in the South gorilla habitat at the Dallas Zoo. Unlike the other four males that Zola lives with, the 14-year-old Western lowland gorilla has a special relationship with water in particular. His handlers say he loves nothing more than rain puddles, moats and - as a new viral video reveals - giant kiddie pools filled with a foot or two of H2O (gorillas can't swim, by the way). 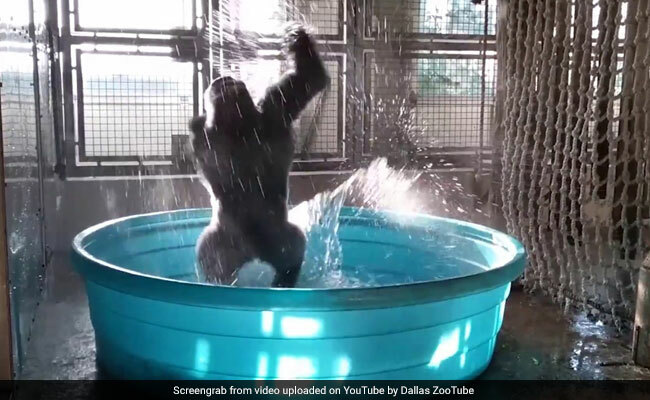 The video, posted to the zoo's YouTube page on Tuesday, shows the gorilla splashing, thrashing and spinning like a top in plastic pool in a manner that brings to mind an overgrown toddler. The video has racked up about 500,000 views so far and led many to refer to Zola on social media and in news headlines as the "break dancing gorilla." "We've always known he likes water, but we weren't expecting the full washing machine-style spin that we caught on camera," the Dallas Zoo's mammal curator, Keith Zdrojewski, told The Washington Post. "He also loves to splash and do this type of behavior in the rain." Zdrojewski said the pool isn't just for fun and is considered an "enrichment item" that zoo keepers use to engage primates. "Enrichment can take many forms; it can be an object such as a ball, a scent like an herb or perfume, visual stimulation such as a mirror, a change in an animal's company or location, an activity like painting or training, introduction of a new food, or a challenging food presentation ... the options are almost limitless!" the Dallas Zoo said in a blog post about Zola's kiddie pool play. "As keepers, we are constantly coming up with new and fresh ways to enrich our animals. And clearly the pool is a favorite for Zola!" But is Zola actually having a blast or is he exhibiting anxious behavior resulting from the stress of living in captivity? Tara Stoinski, president and CEO, and chief scientific officer of The Dian Fossey Gorilla Fund International, said her first reaction to video was to "laugh and smile." "Gorillas often like to play in water or even use as a mirror to look at themselves," she said. "The Dallas Zoo animal care staff have given Zola a great source of entertainment and he is having a wonderful time showing the very silly side of gorillas." Stoinski said gorillas living in zoos need complex social lives with lots of interaction to remain healthy. She said it was obvious that Zola was enjoying himself in the pool - and not engaging in a stressful, repetitive behavior - because stressed gorillas are often withdrawn, quiet and uninterested in interacting with their environment. "It is the exact opposite of what you see in this video," she said. Experts said stressed gorillas display telltale signs as well: tight lips, tight shoulders and peering out at the world from the side of their yes, not unlike humans. In cooler months captive gorillas can go months without water to play in, which may explain some of excitement Zola displayed on camera, according to Amanda O'Donoughue, a former zookeeper who penned an insightful take on the death of Harambe, a 17-year-old western lowland gorilla at the Cincinnati Zoo who was shot after he grabbed and dragged a 3-year-old boy who fell into the gorilla enclosure last summer. "When I was a keeper, I would create a Slip 'N Slide for one young male and he would slide back and forth on the wet concrete," she said. "It was hysterical and we both had so much fun playing in water in the warmer months. This is wonderful enrichment for these very large, smart, and active animals." "It's the keepers' responsibility to enrich their animals with activities like these and these keepers are doing great things," she added. Ian Redmond, a renowned conservationist and the founder of the Ape Alliance, agreed that Zola was expressing "exuberant play" with elements of "adult display." He said that playful young gorillas in the wild love to swing on vines and sometimes twirl around until they get dizzy and fall over. Silverback western lowland gorillas, he noted, have been observed splashing water while harvesting plants in flooded clearings in the rain forest, a display that is also reminiscent of Zola's behavior. "If you look closely at the zoo video, you can see the twirling gorilla has an open-mouthed play face, and I suspect if we had the real soundtrack instead of the superimposed music, we'd probably hear him play-chuckling," Redmond said. "Zola is having fun. What surprises people who don't know gorillas is how inventive and joyful their play can be, and how graceful they are." "There is a video online of another silverback in a Japanese zoo spinning on a wet concrete floor," he added. "Again, amazing grace and balance, but so sad in both cases to see such magnificent beings in such bleak concrete, steel and glass enclosures leading a life of social and sensory deprivation compared to their wild brethren." This isn't Zola's first time going viral for his watery play routine. Back in 2011, at Canada's Calgary Zoo, a significantly smaller Zola was filmed thoroughly enjoying a wet concrete floor, as well as spinning. Video of the routine amassed nearly 4 million views on YouTube. Zola was moved to the Dallas Zoo in 2013, his keepers said. The question now for Zola's keepers is how long he'll keep up his youthful antics. "He'll either be a goofball his entire life or at some point he'll stop, maybe when he becomes a father," Zdrojewski said. "Gorillas all have individual behaviors and personalities. Some are silly and some are authoritarian. We really don't know how he'll grow and change."